CMTA has worked with the Employment Training Panel for over 15 years to assist companies through the application process. We have the expertise to help you navigate through the process so that your project will be successfully funded. If your project is not approved – we don’t get paid! CMTA provides a variety of fee-based services including complete administrative support after your ETP project has been approved. CMTA uses a proprietary database to ensure that your company can easily organize and report the required tracking for the ETP. CMTA offers Quick-Start Training that allows you to start a short training program now and you can use an in-house trainer or an approved outside training vendor. 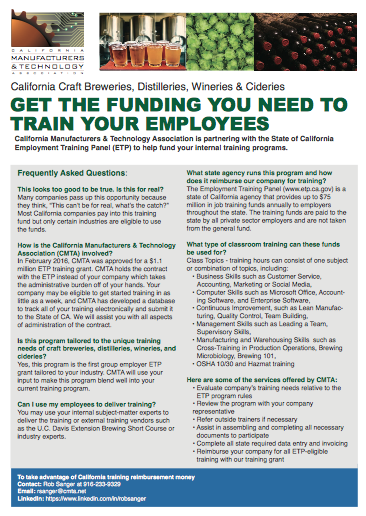 CMTA has already applied for these training funds for our member companies so you don’t have to hassle with the ETP paperwork and application process. CMTA helped shape legislation governing the ETP program in 1983 and has been actively involved in the program ever since. CMTA has successfully assisted companies in the development and administration of over 200 successful ETP funded training projects. CMTA has the experience, trust and reputation needed to navigate you through the ETP process. Trust the company that the ETP uses to market their own program. Trust the company that has worked with the ETP since their inception. Trust the company that can navigate you through the ETP program and offers a variety of ways to apply for ETP funds.